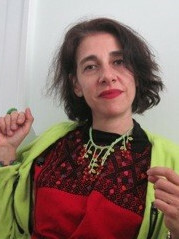 Verónica Grossi is an Associate Professor of Latin American Literatures in the Department of Languages, Literatures and Cultures at the University of North Carolina at Greensboro. She is the author of Sigilosos v(u)elos epistemológicos en Sor Juana Inés de la Cruz (Madrid, España-Frankfurt, Germany: Iberoamericana-Vervuert Verlag. 2007), which received Honorary Mention for the Alfred B. Thomas Award of the Southeastern Council of Latin American Studies, 2009. She is also the editor of Escrito en México (1974-1984) by Enrique Fierro (Mexico City: Fondo de Cultura Económica, 1999). She has published articles on early modern and modern Latin American literature as well as creative writing pieces in Spanish and English in refereed journals and books from the United States, Latin America and Europe. The Enigmas offered to the Discreet Intelligence of the Sovereign Assembly of the House of Pleasure by her Most Solicitous and Devoted Sister Juana Inés de la Cruz, Tenth Muse (Lisbon, 1695) is an unpublished work considered minor, whose finding Enrique Martínez López made public in 1968 (reprinted in 1970) and Antonio Alatorre reedited in 1994 (reprinted in 1995). The Enigmas, addressed to a feminine public, both courtly and learned, including the Countess of Paredes and the Duchess of Aveiro, are an interpretive key to Sor Juana’s entire oeuvre. As in her love lyric, this very little studied piece reconfigures the symbol as well as the role of woman within Petrarchan rhetoric, adding to it an unprecedented epistemological dimension.